It could be that you find here the most closest example to configuration of yours! Please look at "Gallery" and say to our managers this information when you will have a dialog with them. It can help us to make the best configuration for You! ISBC company don't make installations, but we can find the best our partner! If you would like to make installations by yourself - please be in contact with our technical service to get the best help and technical support. We also provide "installation supervision" services. If you have any questions about our solutions and equipment, please be in contact with us! We will help you to solve your task and to get aim in the closest time. If you have question about partnership, please be in contact with us. The expiration date of RFID tags is practically unlimited. High stability of reading RFID tags. Adjustable range of reading labels from half a meter to 16 meters. Protection of RFID tags from cloning and falsification. The ability to use RFID cards with an individual design. The possibility of using RFID-tags that can not be transferred to another person (when trying to remove from the car, the label is destroyed). The ability to work as part of the IT infrastructure or autonomously. Organization of non-stop entry to the controlled territory: to parking, to yards, to the territory of the village. Quick access of special vehicles, cars of the Ministry of Emergency Measures, ambulances. Very good comfort level to get an access to territory. Increase the level of security in the controlled area. The vehicle is equipped with a miniature device - an RFID tag. An RFID tag can have a different form factor. The most popular are three models: RFID-sticker on the windshield, RFID-card, RFID-tag in a durable plastic case for external fastening. 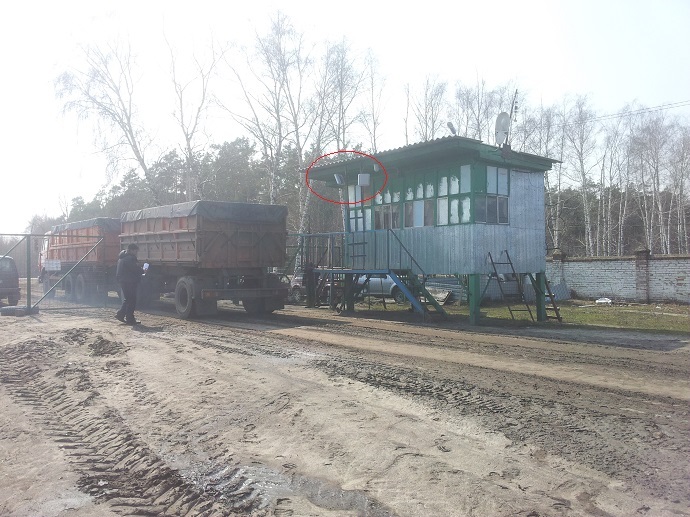 In the vicinity of the checkpoint, equipment is installed: RFID-reader and RFID antennas. Depending on the requirements of the customer, the equipment can run autonomously or under the control of the information system (software). Also the equipment can be connected to an existing system - most controllers are supported. The range of registration marks is configured programmatically and can reach 16-18 meters. Depending on the requirements, the car can be registered even at the entrance to the barrier or in close proximity to it. If an RFID tag hits the antenna coverage area, the system checks the label according to its / foreign scheme, then the access rights are checked (time, day of the week is also checked). If all checks are successful, the system issues a signal to the barrier, gate or other barrier. RFID-technologies of ISBC are base on frequency range of UHF (860-960 МГц). Such kind of RFID-equipment helps to create different types of systems very easy and with very good quality with a lot of advantages if long range reading up to 20 meters*. We use it to make systems for people monitoring, for vehicle contactless access control. The main advantage of UHF RFID is the longest tag reading distance - up to 20 meters*, also it could be more (depends of a lot factores). 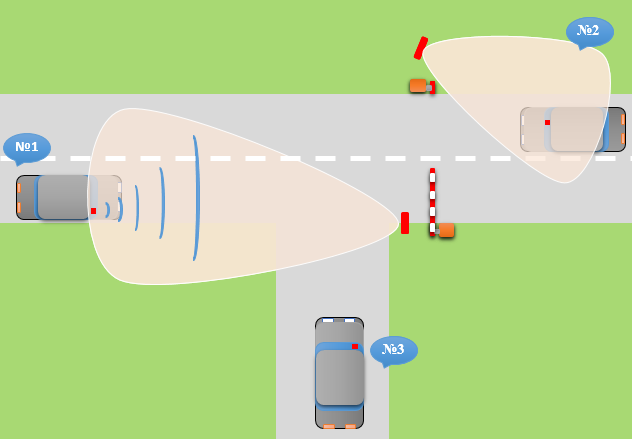 When you use it for vehicle access control - no need to go out from the car to tap the RFID-card, all actions comes contactlessly in a long range distance - it is very comfortable to use if in everyday life! RFID-card or RFID-label identification has place on the long distance, so when you are near the gate it is being opening already. The distance could be configured to reduce it or increase. it is impossible to grab internal code RFID-tag (it is very hard to make using simple EPC tags, and impossible with NXP UCODE DNA chips). Our RFID-tags have some stages of security. It helps us to avoid RFID-tags clones and internal code grabbing. Unregistered tag will never work with system. Some kinds of RFID-tags are very hard to grab - we mean about simple EPC UHF tags, but also we can work with crypto-secured tags based on new RFID-chip from NXP, called UCODE DNA - it is not possible to clone it or to read data without AES128 keys. To get mor detailed information, please be in contact with RFID support service, we make some other comments if indeed. Also we would like to pay your attention to very low cost of RFID-tags in compare with other technologies like keyfobs for gates. The difference between price of RFID-tags and standard keyfobs - 10s times. If you have any questions and some calculations of economics for RFID-system - please be in contact with ISBC sales. 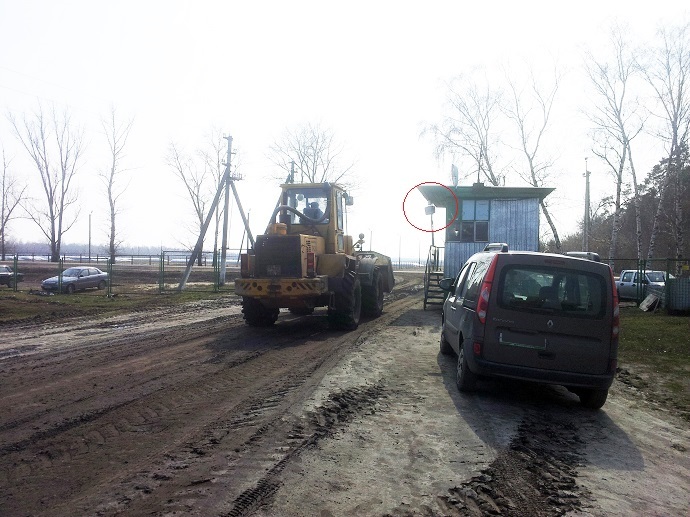 Bellow we have a picture with some installations of RFID-equipment including RFID-reader and RFID-antenna. 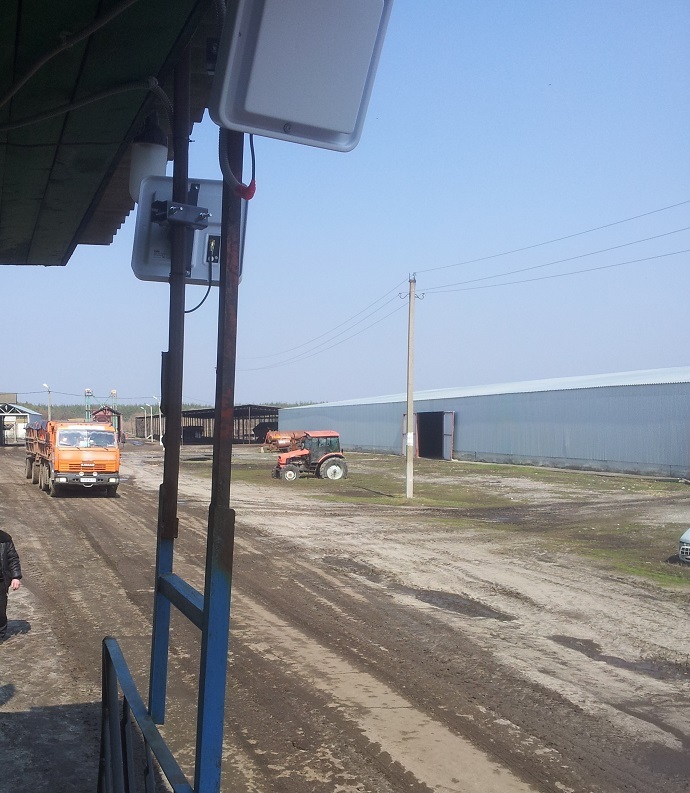 the using of RFID technologies in vehicle is very wide! Using is not full of gates and barreer control - also we can use it in toll applications. This technology helps us to create FreeFlow tolling gates without any stop to pay. We can work on very high speed up to 200 km per hour (without authentication and up to 180 with its). RFID is very high speed of identification, good confidence and accuracy. RFID system is scalable and can be constructed like modular structure, that helps us to increase the functionality in future and very comfortable service. Contactless RFID access system ESMART for cottages. Contactless RFID access system ESMART for individual house / cottage. Contactless RFID access system ESMART for townhouses village. Contactless RFID access system ESMART for individual house (very low price). ISBC company make technical support for free - without any money, our main aim - is to help you to solve the problem in contactless access systems! A disposable RFID tag in the form of a self-adhesive label. 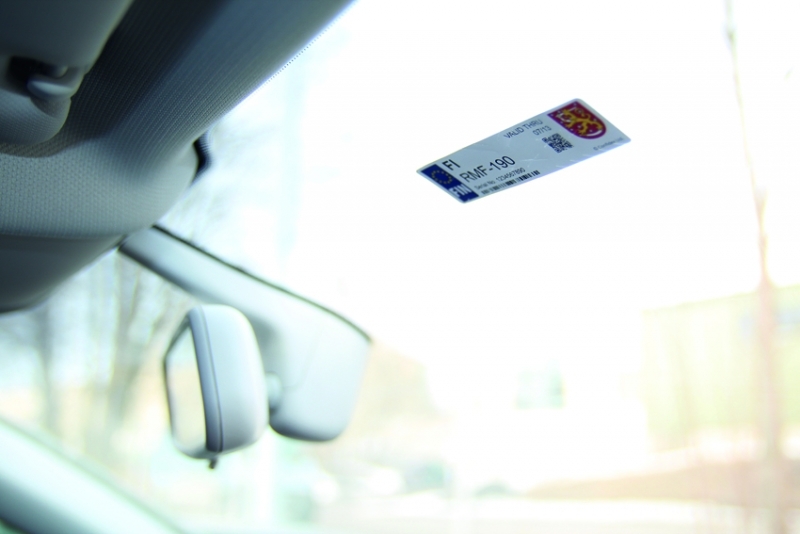 It is designed for fastening to the windshield of the car, has an extended identification number TID - unique label number pre-programmed by the manufacturer, it is impossible to erase and change this number. The label is one-time, designed in such a way that when you try to remove it becomes damaged and stops working. The temperature operating mode of the label is -35 ° C to + 70 ° C, the range of confident reception is 8 meters *. An RFID tag for identifying a car and other vehicles is excellent for identifying trailers and containers. Adapted for fastening directly to the car body. This RFID Tag has a unique number and additional memory for encoding user data. A unique number pre-programmed by the manufacturer, it is not possible to erase and change this number. The label is reusable, fastened in various ways (for screws, rivets, for glue). The temperature operating mode of the label is from -30 ° C to + 60 ° C, the range of reception is up to 16-18 meters *. RFID card with UHF chip (865-868 MHz, UHF-карты). Distance is up to 8 meters*. Also, using this card you can solve the task of people monitoring. This car could be blanked or with print. 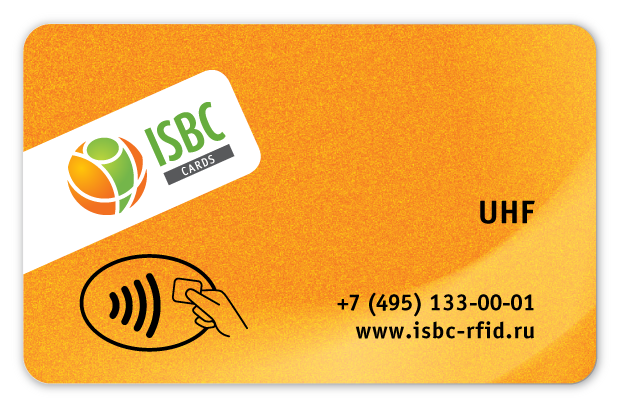 To get more information about printing on RFID-card, please be in contact with ISBC technical support service and sales. RFID sticker with built-in UHF chip and antenna, transparent. The sticker is passive, it does not have a battery, it works at ultrahigh frequency (865-868 MHz). Used in car identification systems at medium distances, about 6 meters *. 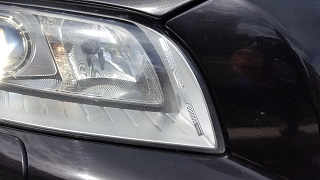 The label is glued in such a way that the light beam of the headlamp is not crossed. The label is designed specifically for use in tasks related to the distribution of cars (car dealerships, car dealerships). RFID sticker with built-in UHF chip and antenna, paper for printing. The sticker is passive, it does not have a battery, it works at ultrahigh frequency (865-868 MHz). Used in car identification systems at medium distances, about 6 meters *. The label has a special adhesive composition, which, when the label is removed, leaves no traces.